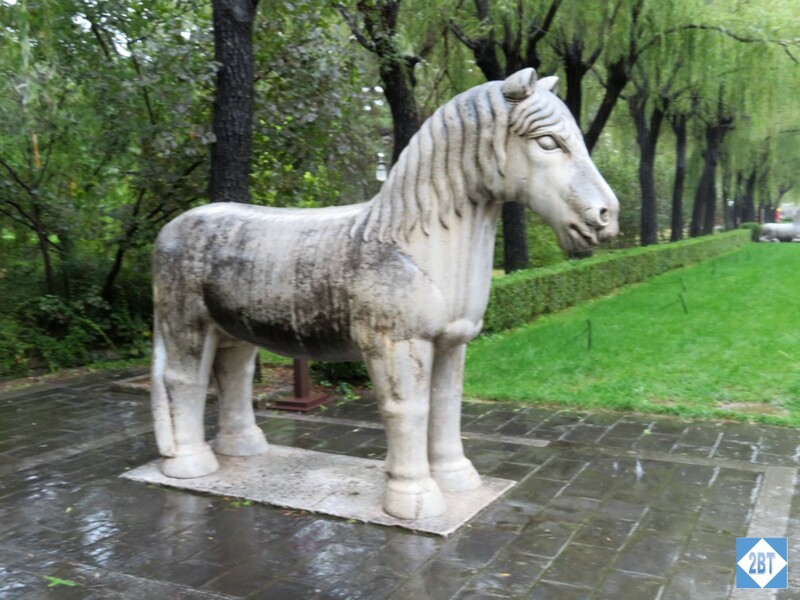 Our next stop was a UNESCO World Heritage Site, the Sacred Way of the Ming Tombs. 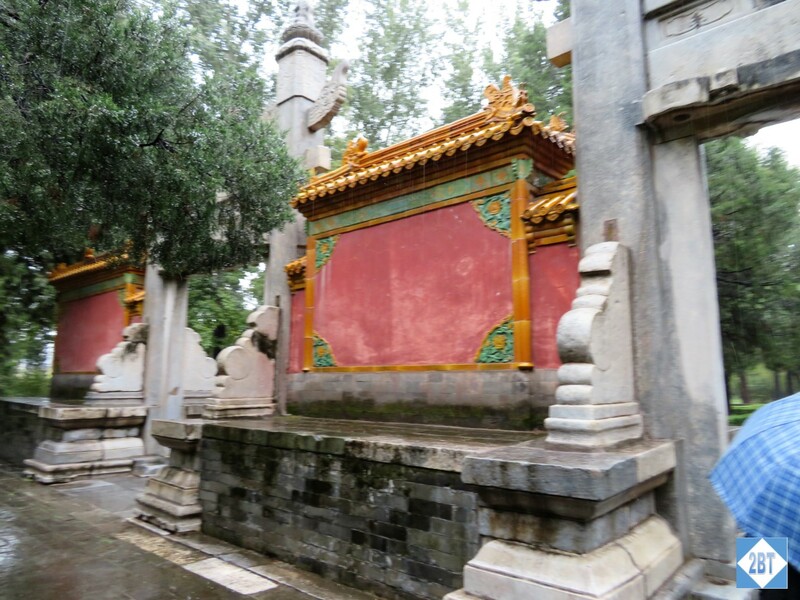 The tombs are a collection of mausoleums built by thirteen of the emperors of the Ming dynasty. 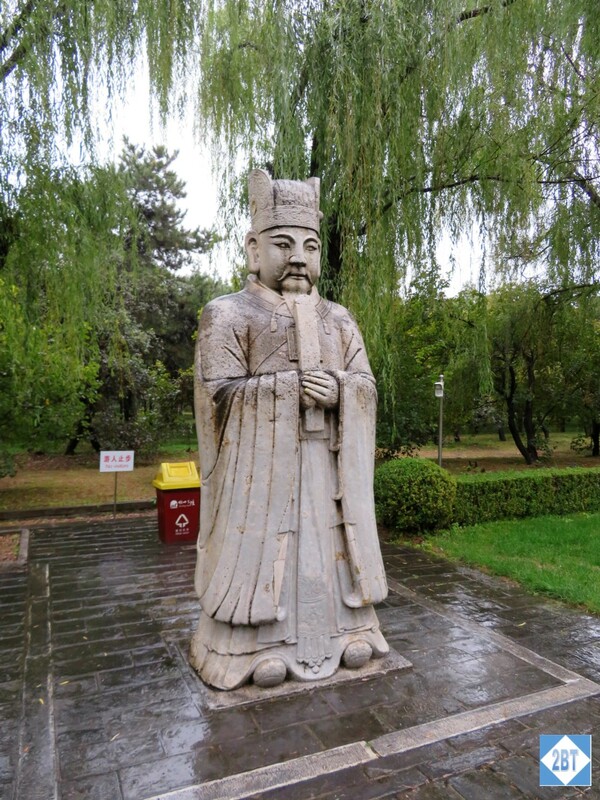 The third emperor of the dynasty was the first to have his tomb constructed here in the early 15th century. 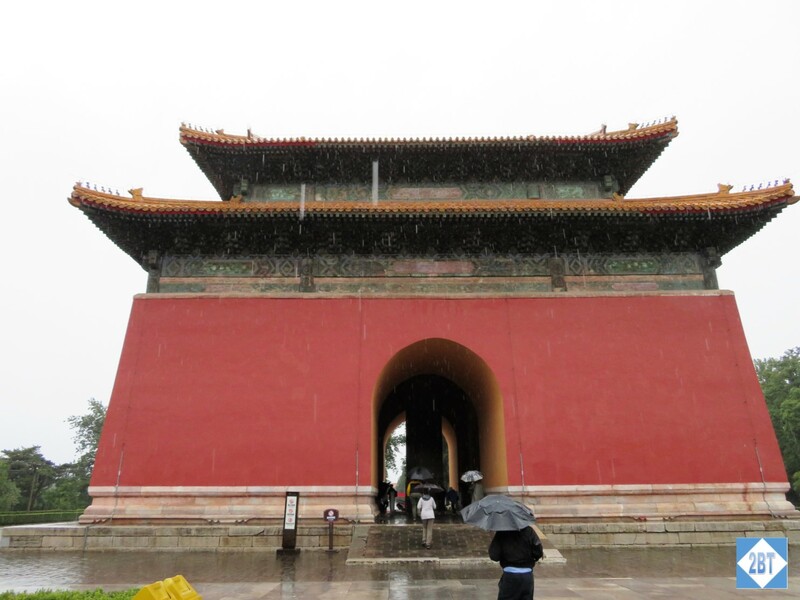 The last emperor buried here was the 17th Ming emperor who committed suicide in 1644. 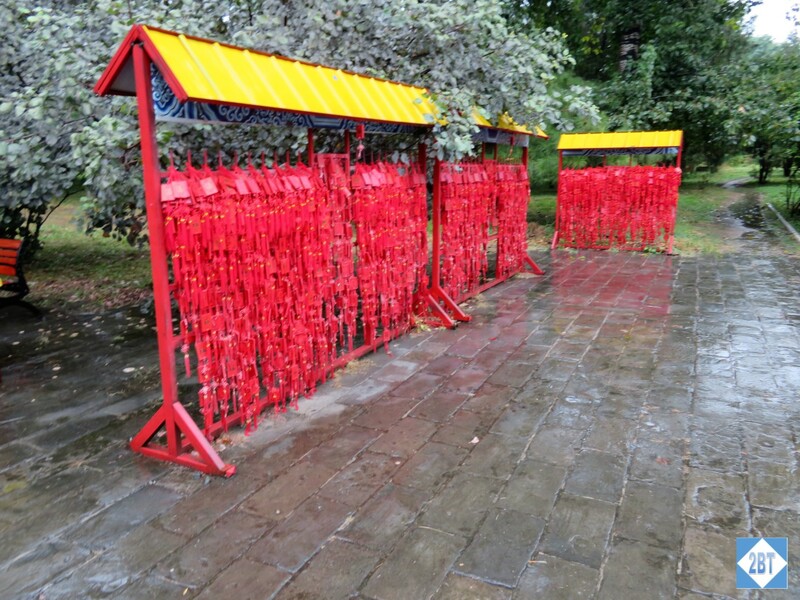 The tomb site was selected based on the principles of feng shui which indicate that bad spirits and evil winds come from the north, so the tombs are built on a south-facing slope of Tianshou Mountain in an effort to deflect them. I don’t feel we really got a good feel for this attraction but it was due to the weather. It rained steadily the entire time we were there, which meant we hustled through it faster than we likely would have otherwise. There were no vendors out either which no doubt saved some of us some money but it would have been interesting to see. The Sacred Way is named as such because it leads from the valley to the foot of the mountain where the tombs are found. 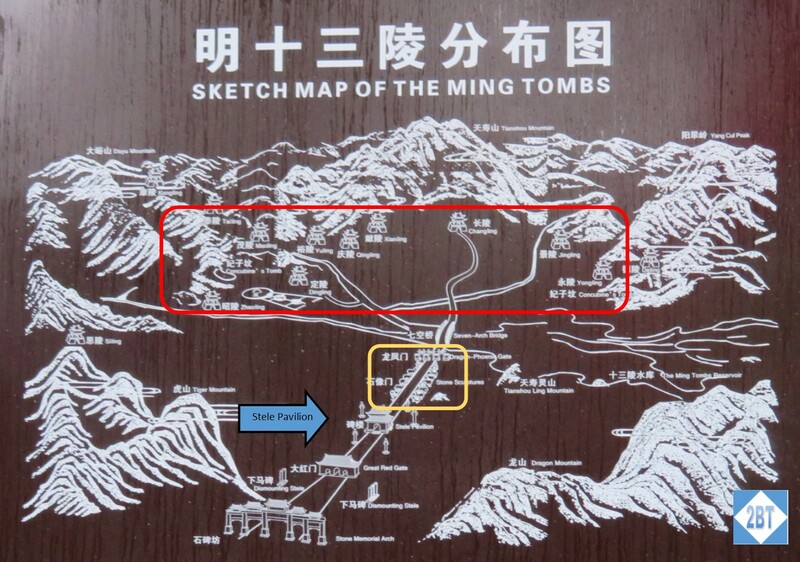 This map of the site illustrates the Sacred Way and its relationship to the tombs. We actually walked only a small portion of the Sacred Way and we did it in reverse, as if coming down from the tombs. First we walked through the Dragon and Phoenix Gate. 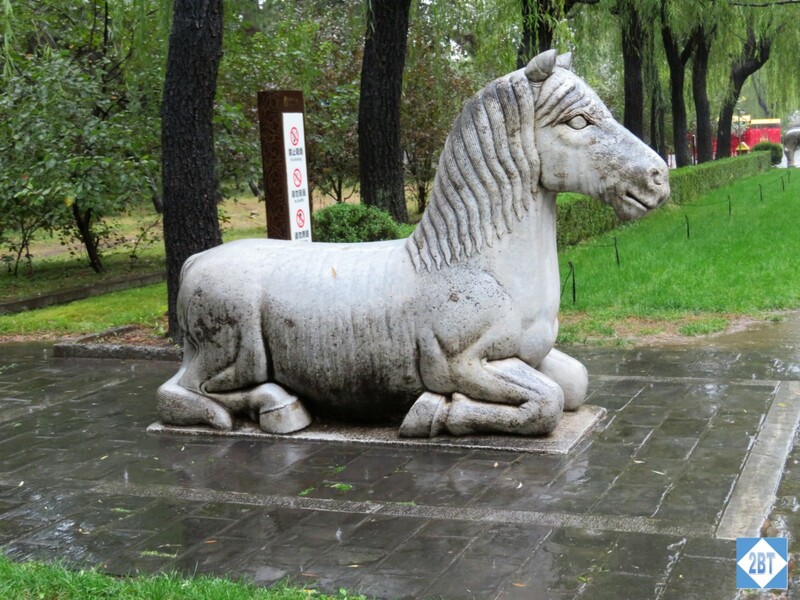 We saw passed six pairs of statues of officials and then twelve pairs of statues of animals. Each animal is represented by two pairs: one standing and one crouching or prone. 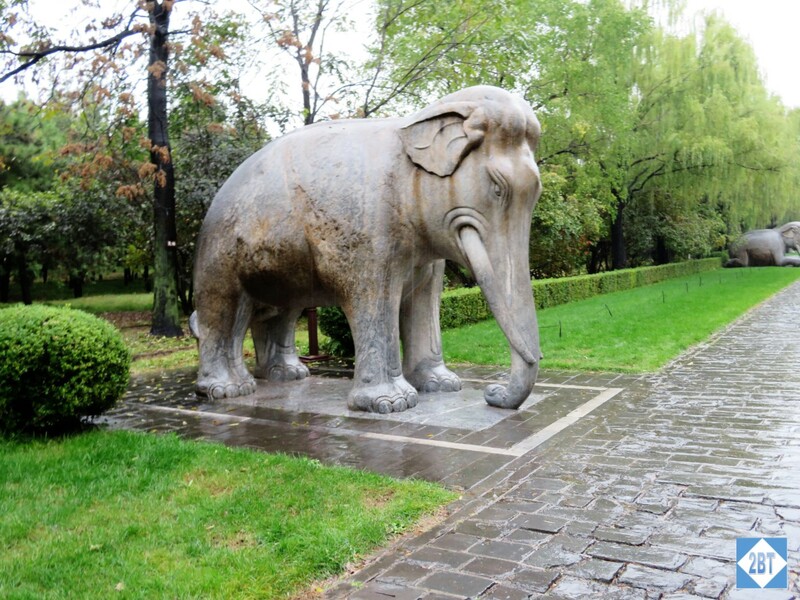 Legend says that the animals have a changing of the guard at midnight but we did not stick around (in the rain) for that long. 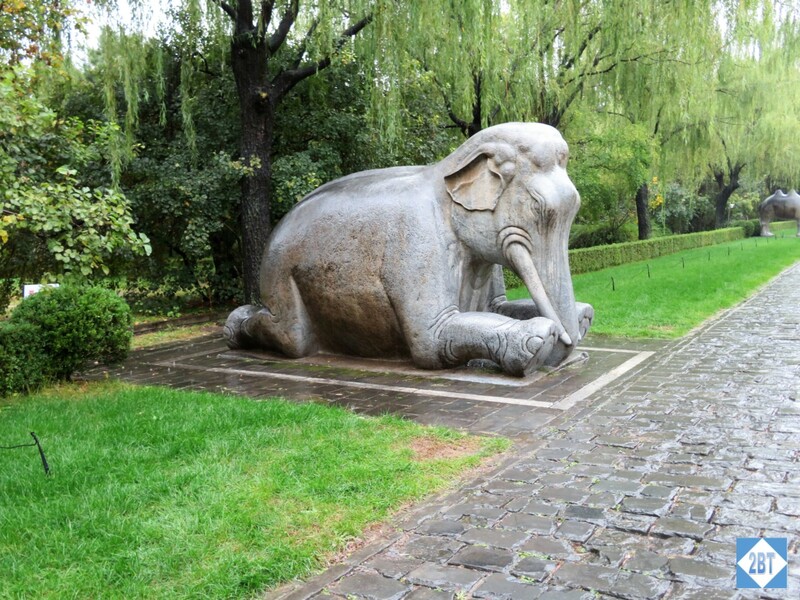 Each of these statues is sculpted from a whole stone. 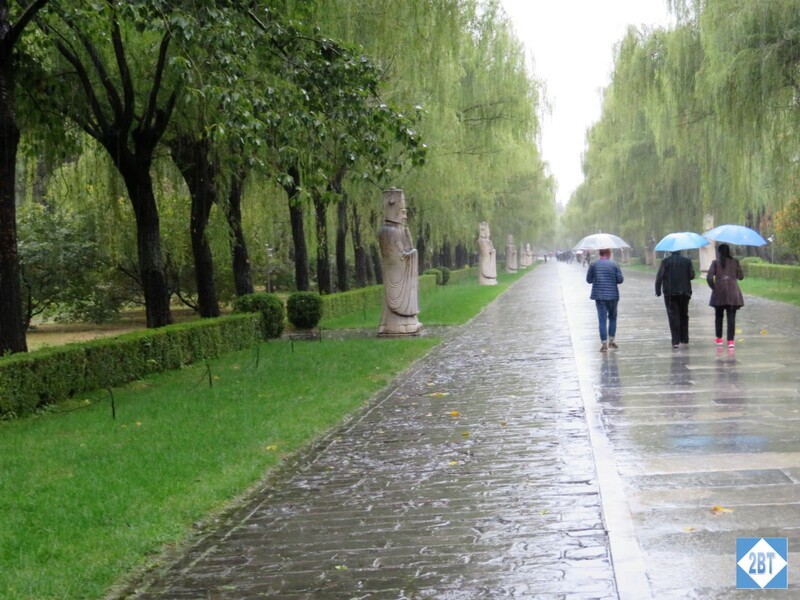 On the other side of the statues was an area that in better weather had vendors selling these sacrificial items. I believe that purchasers buy one and hang it somewhere and light the strands on fire while praying for their dead. 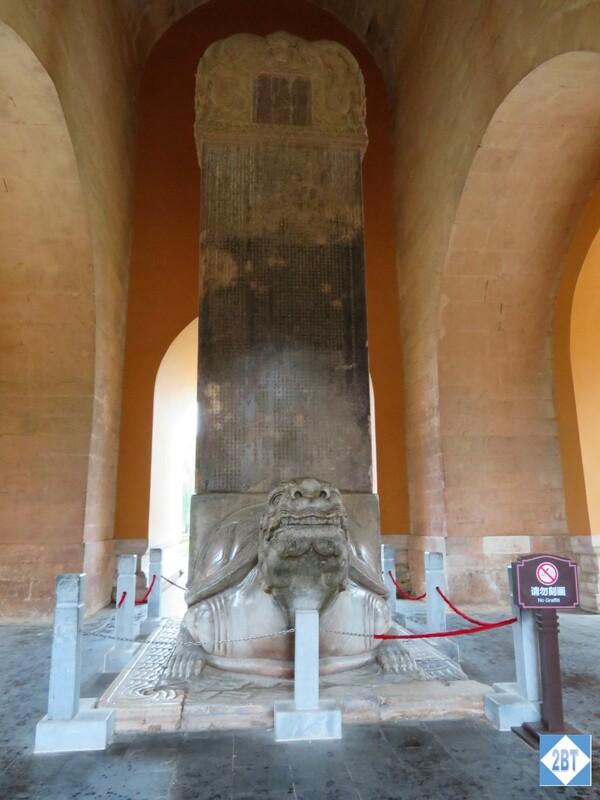 Next, we encountered the Shengong Shengde Stele Pavilion which features a Bixi turtle carrying a giant stele. 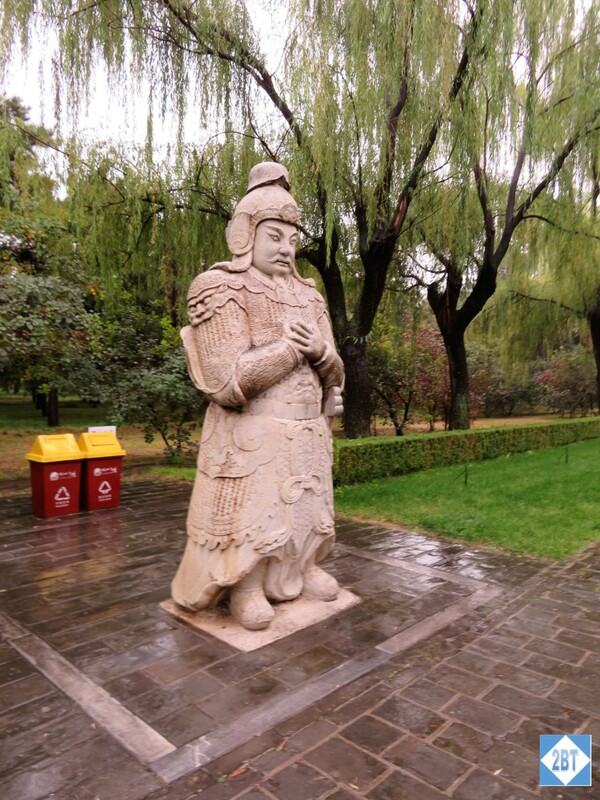 The Bixi turtle is a mythological creature that is one of the nine sons of the Dragon King and is commonly used in funerary complexes of emperors. 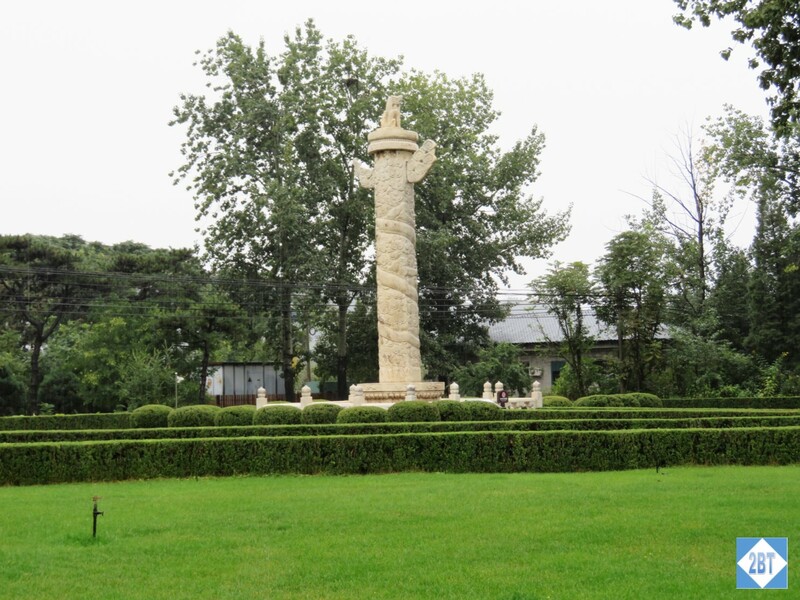 Outside the Stele Pavilion are four of these white marble pillars, or Huabiao, each of which is topped with a mythological creature. 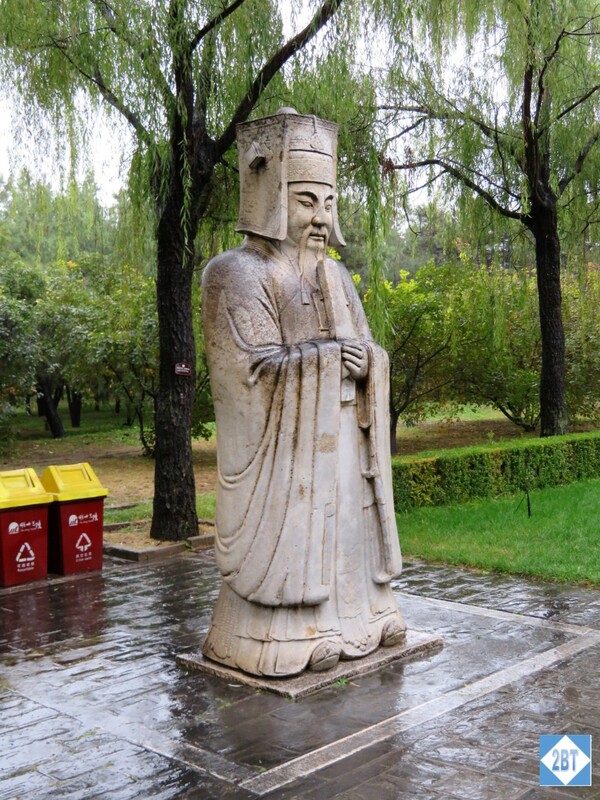 The creatures face either inward or outward, hoping the emperor will neither cling to the palace nor forget to return. It was late afternoon by the time we finished here (in the rain) and we were happy to head back to the hotel to dry out for a bit.